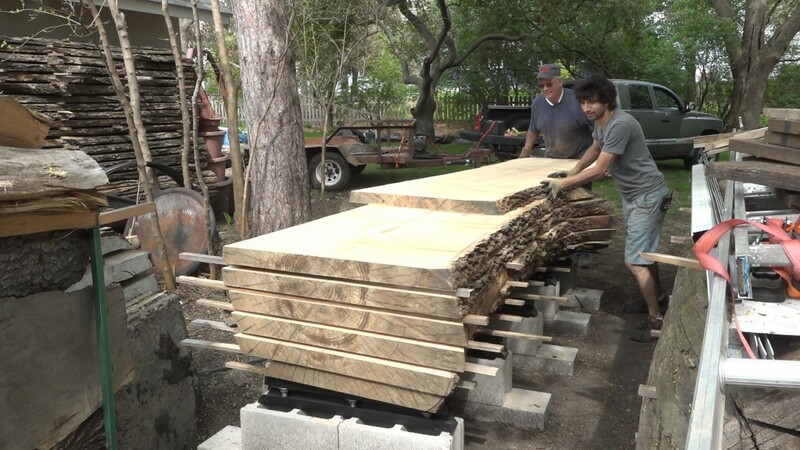 Setting up a flat base for stacking lumber to dry is and essential part of the drying process. It can be a tedious process and if the base changes or the stack needs to move, you have to level the area again. I decided to make some base levelers for my lumber stacks so I can quickly, easily, and accurately ensure a flat base for drying my lumber. 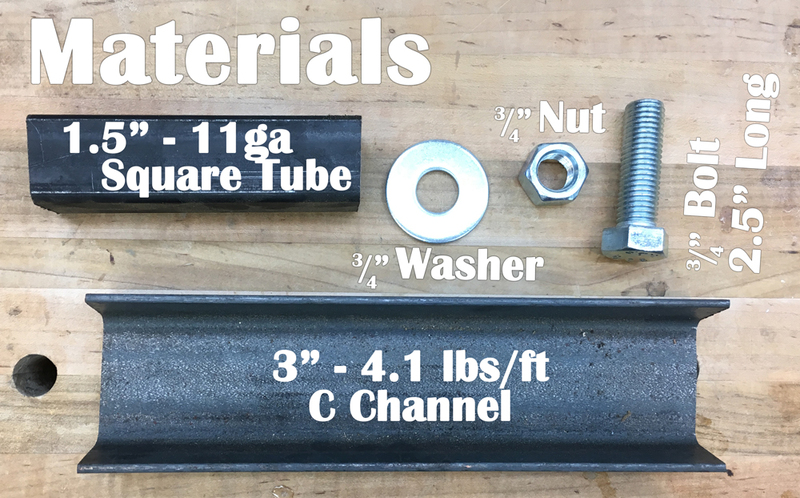 My local steel dealer sells c channel in 10′ lengths and tube in 12′ lengths (through their retail area). 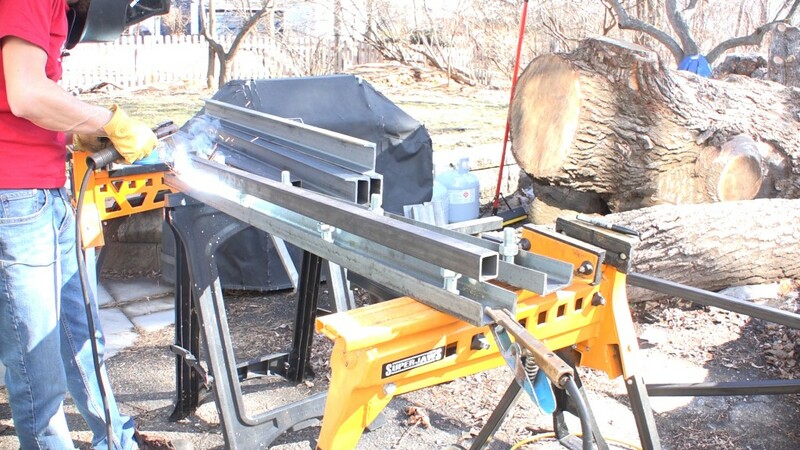 I’ll break these lengths down into the parts I need with my circular saw. Accuracy here isn’t too important. 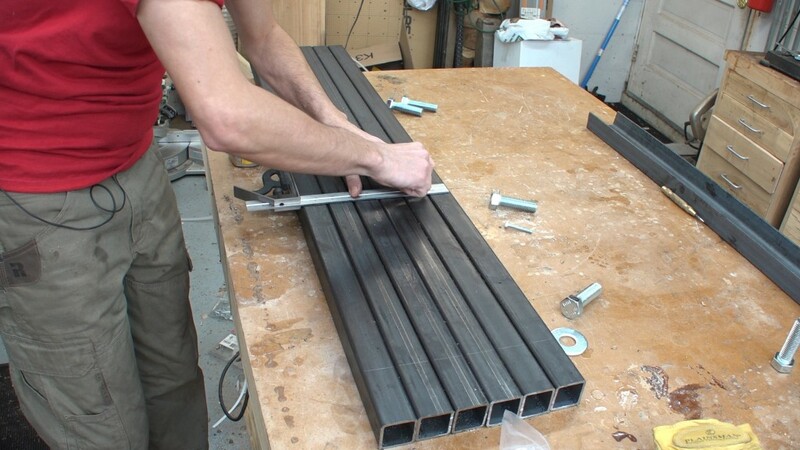 The tubes get cut 2″ shorter than the channel. I’ll take the tubes into the shop to drill the clearance holes for the bolts. I flush all the tubes up on one end and lay all the holes out from that side. That negates any issues with all the tubes being slightly different lengths. I use a scribe and a combination square to lay out the holes and use a center punch to mark the hole locations. 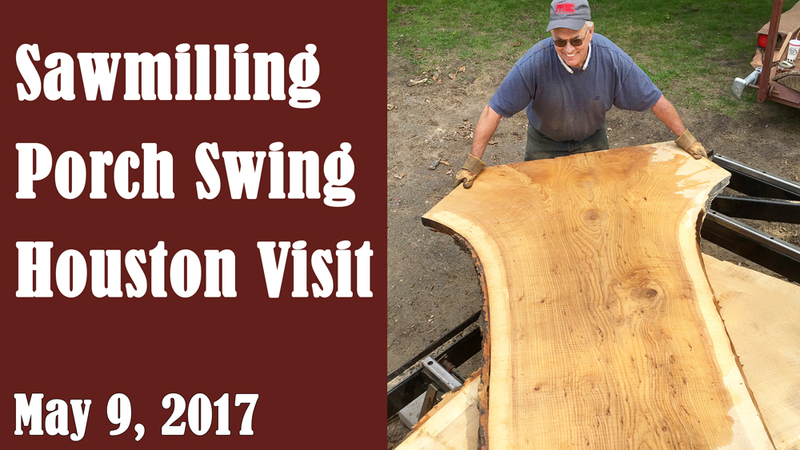 The holes are drilled on the drill press with a 15/16″ plug cutter. This size hole will leave enough room around the bolt for it to freely pass through the hole. A little test to see how everything is looking before welding in the bolts. The positioning of the bolts is the most important step but due to the size of the holes in the tube it still doesn’t have to be super accurate. This is after all just a utility project. As long as the tube can move up and down the bolts freely, it’s all good. To get these aligned, I start with one of the end bolts and tack it in place. I then center the bolt in the hole by feel – moving the tube back and forth to feel the extents of the hole and moving the tube to roughly half that distance. Once that’s in place, I’ll go to the other end and move the bolt back and forth to again feel the extents of the hole and place it roughly in the middle. Then I’ll tack that one in place. Without moving the tube, I’ll move to the middle bolts and use the same process to get them aligned with the center of their holes and tack them in place. The tube can then be remove and the bolts can be permanently welded to the channel. The corners of the c channel can be cut off. I did this mostly for aesthetic reasons but also for safety reasons – one less pointy corner in my life. I went over the ends of the channel and tube with a grinder to break the edges and then they’re ready for paint. Getting these set up couldn’t be easier. I like to use a string for the set up but a laser level can also be used. The string can be run corner to corner and when the strings intersect in the middle, the two outside levelers are parallel. I drop the middle levelers down so they are not contacting the string which would throw the reading off. 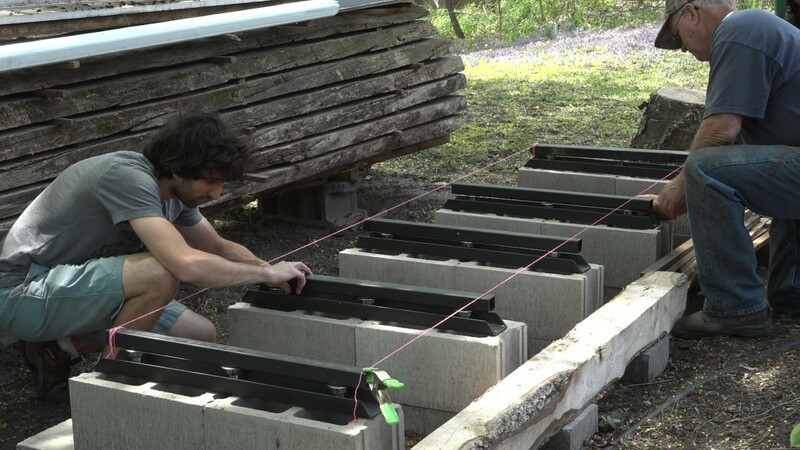 A level can also be used at this step to make sure the levelers are level. I just did this by eye as I am more concerned with the surface being as flat as possible. I’m not too worried if my pile has an unnoticeable lean. With the two outside levelers all set, the middle ones can also be set. I run a string from end to end and bring the ends of each middle leveler up to meet the string. 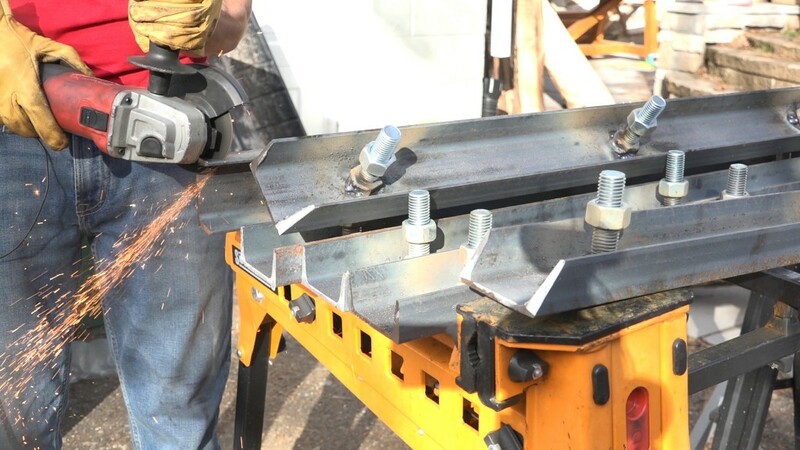 Lastly, the middle nuts on the levelers can be brought up to meet the tube. They just need to come up until the washers don’t rattle. At that point they’re supporting the tube but aren’t lifting it. And now the fun part: stacking! 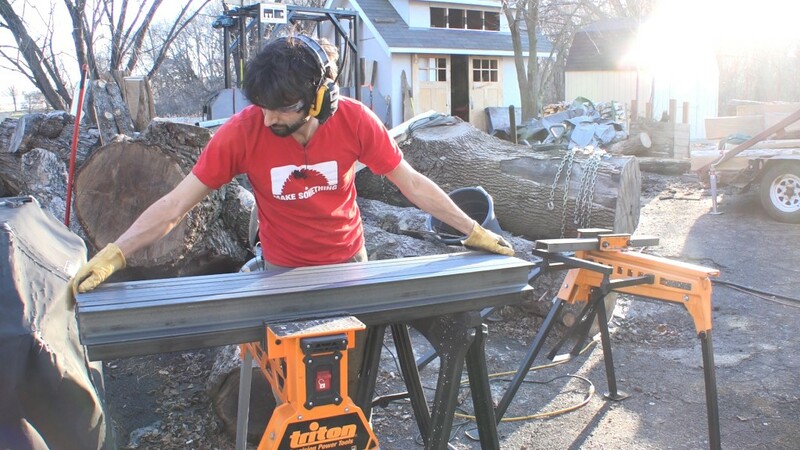 The 48″ levelers are very similar. 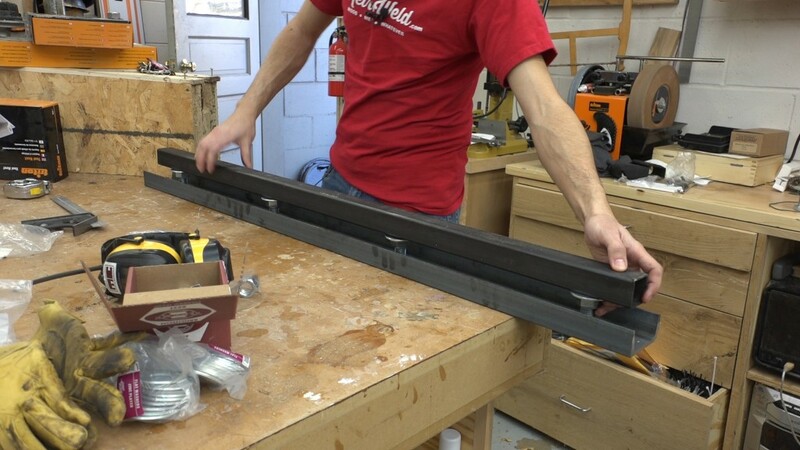 The c channel is cut to 48″ long, the tube is cut to 46″ long, and the spacing between bolts changes to 13.5″. I chamfered the end of the c channel for safety and aesthetic reasons. What keeps the bolts from loosening and falling down overtime? The friction on the nut from the weight on the stack prevents it from moving. Huh, no comments here? Surprising…. Anyway, Matt, if you see these comments, I’m wondering how your arrived at the size of materials you used. They look very hefty. I want to make some of these this spring, but being a cheapskate, I’m thinking of using some 1 1/4″ 16ga square tubing I got free. The 16ga is quite a bit thinner, but I won’t have massive stacks of lumber. 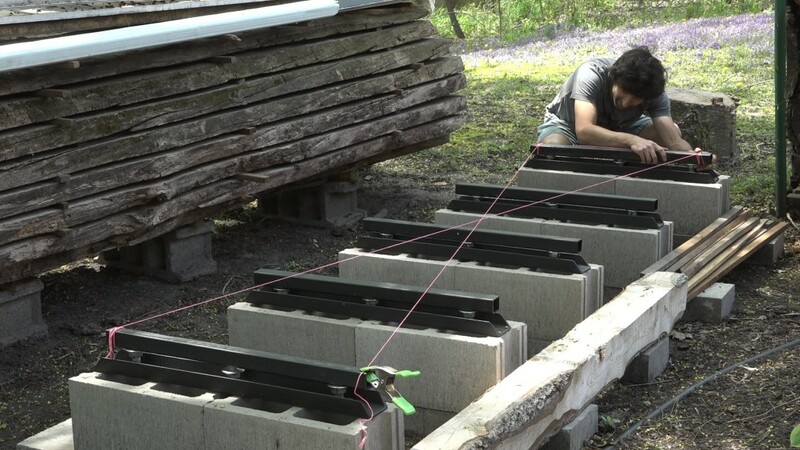 I’m pretty sure your levelers will be indestructible, and I could get by with smaller tubing, but just not sure how much smaller (the thinner wall mainly concerns me). Maybe I’ll just have to try to do some stress analysis on the tubing to get an idea. I would think the load on the tubing is pretty well equally distributed, so that would be a reasonable simplification. 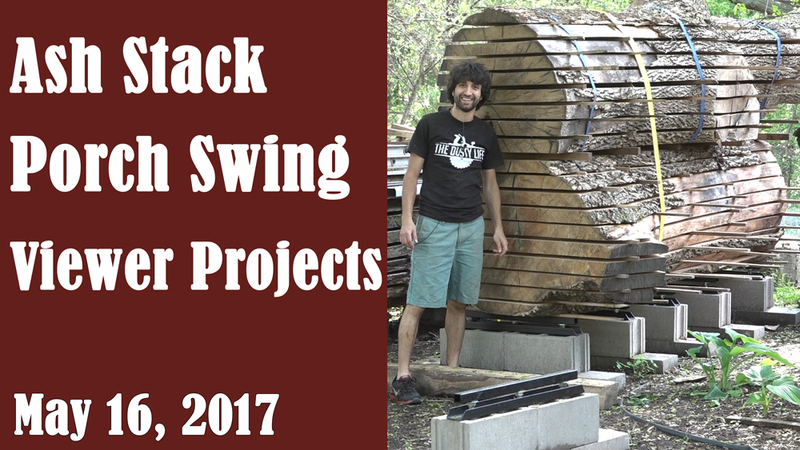 How much do you think your typical lumber stack weighs? I started by taking a look at deflection calculators and also kept in mind dent/damage resistance. I approached it thinking I might set a slab on edge as I start the stack and by set, I mean drop lol. I don’t want to have to replace them and if that top bar becomes bent, it would not be effective anymore. If you’re gentle with that first layer, it wouldn’t be a concern. My larger stacks weigh 8000lbs over 5 levelers.